His solution is to decentralise, pushing devolution forward and shrinking the central overhead. Increasing the number of routes, from eight to 13, is intended to make them more aligned to train operators’ franchises, to improve the synergy between track and train and to reverse poor performance. These 13 routes will fall into five new Regions that will have the headquarters teams to support them and, the idea is, make Network Rail “fleeter of foot”. Many current ‘head-office’ roles and responsibilities are to devolve and will be absorbed by the five new regions, which will be of sufficient size and scale to support the customer-facing end of the business (the routes). 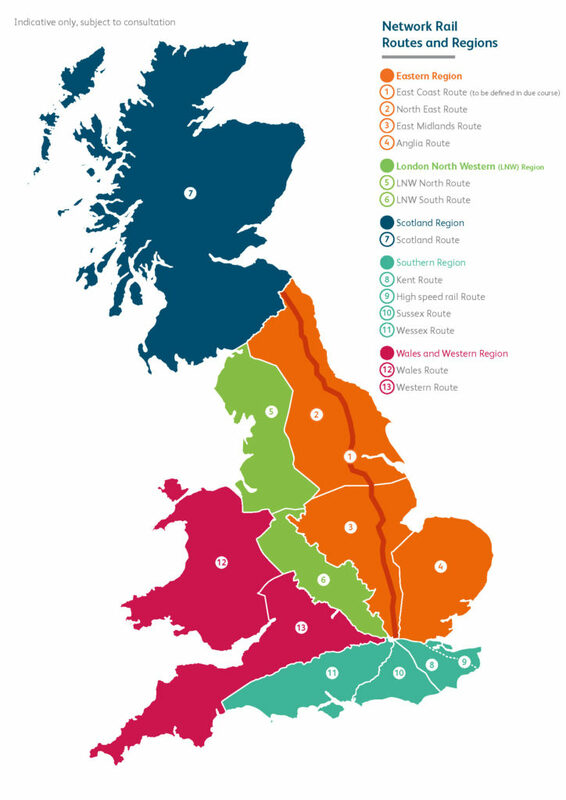 Network Rail’s new organisation – five regions and 13 routes. So the five new regional managing directors will, between them, be responsible for the 13 new routes. The intention is that this will allow Network Rail to reduce its national centre still further and to be much more aligned to the passenger and train operators, enabling a more cohesive and joined-up railway focussed on delivering a better and more punctual service for customers. Finance, HR, Communications, Legal and Property will be largely unaffected by the programme at this stage, although each will be developing their own plans for how to integrate with and support the new operating model for the business. The names of the individuals taking up the new roles have not been released. Posts will be advertised over the coming weeks – those in the routes will be focused on today’s railway and service to customers (operators and passengers) while the regions will concentrate both on the future and, at the same time, support the routes to run the railway. 10 years ago Network Rail was trying to centralise a lot of it’s functions at Milton Keynes. Thankfully common sense has now prevailed and a lot of functions are being devolved back to the routes. Hopefully this will result in a more customer responsive, efficient NR. My heart goes out to my hard working colleagues at NR who, as always, will have to climb the mountains necessary to make this work.